O'Connor has played well for them since Driedger was called up. tim1_2 wrote: O'Connor has played well for them since Driedger was called up. wprager wrote: Bingo is 8-2 and 5th in the Division. They are 6 points back of St. John for 3rd and a guaranteed playoff spot, and they have a game in hand. Both Bingo and St. John are moving next year. Ice Caps are missing some players (callups to Montreal). The fact that we can even think about a way to get into the playoffs is amazing. I thought they were done. What about this Jack Rodewald character ? Never had a reg season goal for the marlies and now he's our highest goal scorer. Late developer but will he amount to much more than an Ahler? Gabriel gagne not doing much in his 20 games with the B-sens... that 3 year contract is looking mighty long right now. But who knows right? Gagne is a project. He was always a 3 or 4 year development player. Could be a player down the road. And a possibly a place for Chabot/Brown/Chlapik to go if their season ends earlier than hoped. You squeak into the playoffs on strong play from O'Connor then add those three and you've got a chance at the Calder Cup as a leaving present to the fine folks in Binghamton. Yeah, Gagne has size, those guys sometimes take a while. As for Rodewald, was he traded here or is it one of those weird arrangements where he's still a Leafs property on loan. I don't have any expectations at all, but he's helping Bingo win. wprager wrote: Yeah, Gagne has size, those guys sometimes take a while. Rodewald started on a PTO with Bingamton and recently signed an AHL contract. Ah, so he must have been released by the Marlies. Matthews must have made Rodewald expendable. I just looked at the up coming schedule for the BSens. Yikes. Won't be easy. Albany Devils will relocate to Bingo next season. wprager wrote: Albany Devils will relocate to Bingo next season. Good for the people of bingo. Albany is a dead city, everything is boarded up there. Can't imagine the hockey was thriving. Whitey White assists Akeson. B-Sens up 1 - nil. Under Dorion's watchful eye. Maybe this is what our PP needs. Found the have on Kodi, Phoenix. Unwatchable. 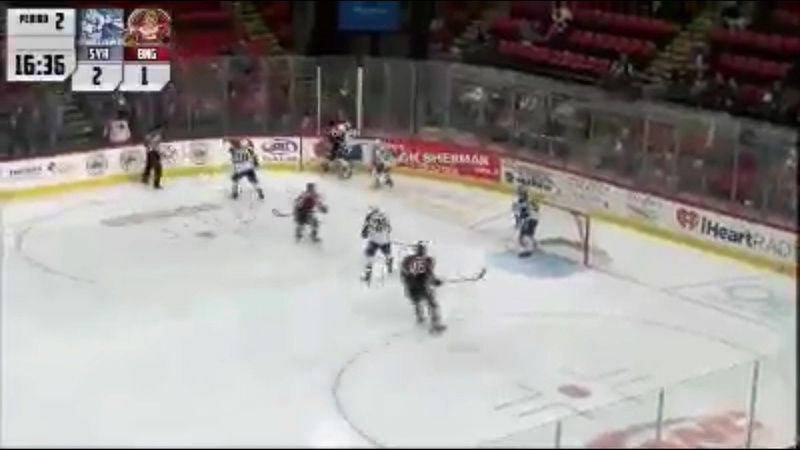 934 Re: All Things Binghamton Senators!